This is the recipe I developed riffing off of fan Cameron Bailey’s ideas. Cameron entered my cake ball contest for developing the concept of a cake ball that I would then develop. Ta da! Here it is…. Pineapple cake (tons of pineapple and pineapple juice in the batter), studded with bits of chopped dried/candied pineapple, held together with dulce de leche. 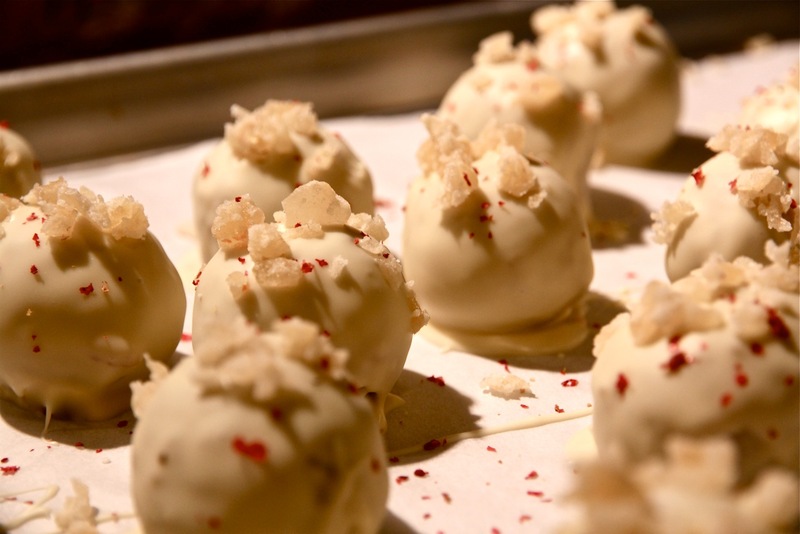 The chilled balls are dipped in white chocolate and sprinkled with more pineapple and a dusting of pink peppercorns. Thank you to all who entered the contest, and Cameron, you rock! Note: I bought my dried pineapple in the bulk section of Whole Foods. It is sweetened and therefore the pineapple is sort of dried, sort of candied. It is chewy and delicious and comes in little dice. Its very easy to chop up further into the smaller pieces that you need for both inside the cake ball and on top. 1. Position rack in middle of oven. Preheat oven to 350° F. Coat the insides of a 9 x 13-inch pan with nonstick spray. Place flour, sugar and baking soda in large bowl and whisk to combine. In a smaller bowl whisk together the pineapple, eggs and vanilla. Add wet mixture to dry and whisk well but just until combined. Pour into prepared pan and bake about 30 to 35 minutes or until a toothpick inserted in the center shows a few moist crumbs. Place pan on rack and cool completely. 2. Crumble cake into a large bowl and toss in 1/2 cup chopped dried pineapple. Combine the cake with 1/2 cup of the dulce de leche. Test by compressing and tasting and add more dulce de leche only if needed for flavor and moisture. Roll into golf ball–size cake balls. Refrigerate until firm. This can be done 1 day ahead; store in an airtight container once they are firm. 2. Line two rimmed baking sheets with parchment paper or aluminum foil. Melt the chocolate in the microwave or a double boiler. Dip the balls one at a time in the chocolate, encouraging any excess chocolate to drip back into the container. Place, evenly spaced, on the prepared pans. Immediately sprinkle with bits of dried pineapple and a few grinds of pink peppercorns. Refrigerate briefly until the chocolate is set. Trim the bottoms, if needed. Place each cake ball in a paper cup, if desired. Place in a single layer in an airtight container and refrigerate for up to 4 days. Bring to room temperature before serving.